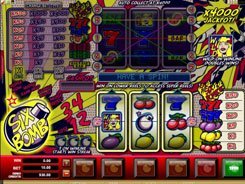 Microgaming gives you another attempt to heist a bank presenting a sequel to the Break da Bank video slot. 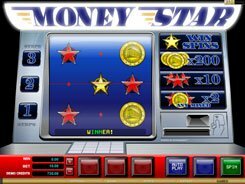 The new version called Break da Bank Again has five reels and nine lines, with its theme revolving around money and bank robbery, as in the original emulator. 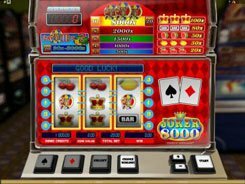 A coin value runs from $0.01 to $0.25. You can play with 10 coins max per line. 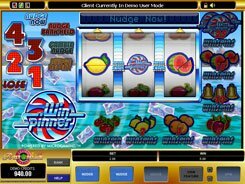 The top bet per spin reaches $22.5. 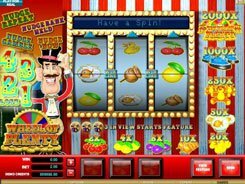 The slot has many symbols, all centered on the theme of robbing the bank: coins, gold ingots, precious jewels, dollar bundles, cheques, etc. 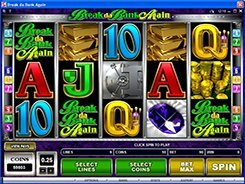 The Break da Bank Again logo is a wild symbol that can stand in place of other icons, except for scatters, to complete any winning combination. Besides, the logo is a five-times multiplier when it serves as a wild symbol. A scatter is represented by the bank vault. Three or more bank vault symbols scattered anywhere will award you 15, 20 or 25 free games. 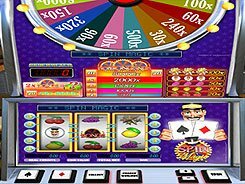 The free spins round cannot be retriggered, still you have additional chances to win, as a wild symbol landed on any active payline during a free spins round will multiply your win by 25.